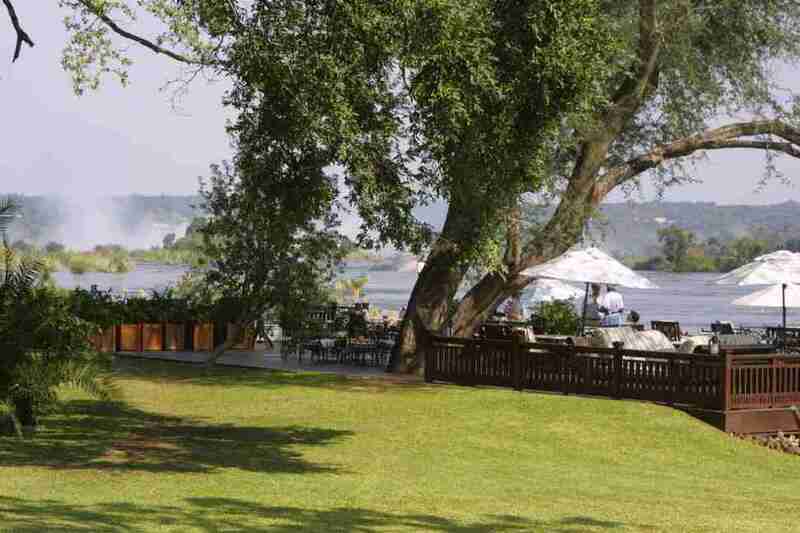 Whilst at Audi Camp, Maun, Austin and Una suggested we stayed at Maramba River Lodge in Zambia for two reasons. 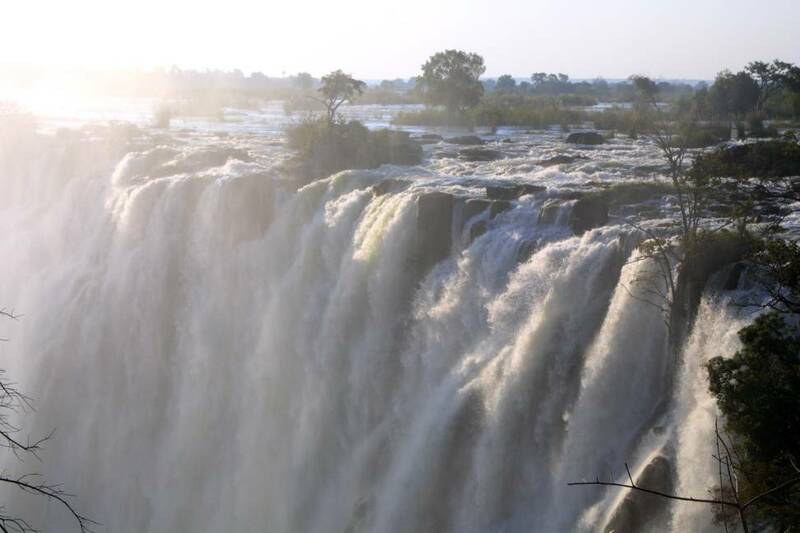 Firstly, it is a delightful campsite near Victoria Falls, and secondly Russell, the owner would place our names on his 'manifest', precluding the requirement to purchase visas for Zambia, for the manifest acknowledges that we have accommodation booked in the country prior to our arrival. British visas for Zambia (and very often other African countries) are higher than for other nationalities in reciprocation for the charges Britain makes to these particular nationals. In our case we saved a total of £70. We had hoped to get a copy of the manifest faxed to Kubu Lodge in Kasane, but this failed to materialise. 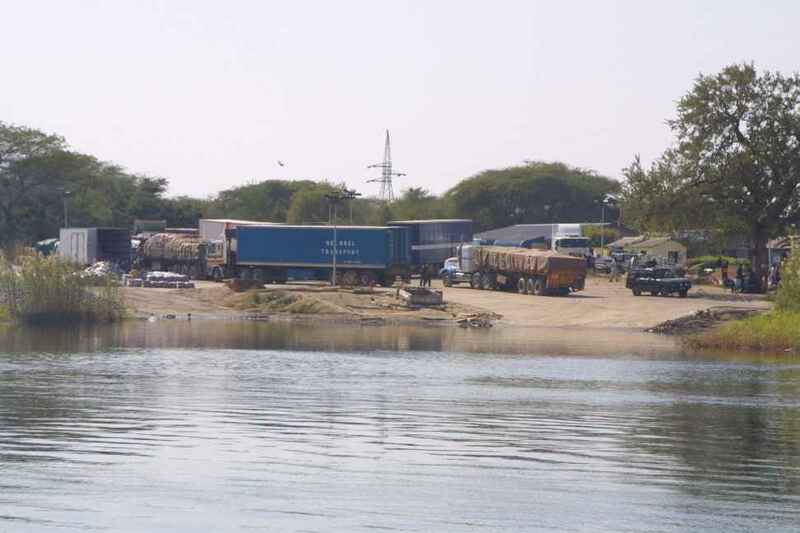 At the ferry point, we waited in line and were soon loaded, behind a double articulated fuel tanker and another car crammed on beside us - Health & Safety did not feature! The crossing was efficient and as we unloaded, we were ushered to the police post to pay our road tax. On both sides of the ferry crossing there were hawkers incessant in their attempts to claim our attention and change money. Immigration were no problem, they accepted our word about the manifest, although they claimed they had no copy either. We got the impression that they could not be bothered to check. Customs were efficient and stamped the carnet. However we had to argue about the 3rd party insurance. We knew we had to have a Zambian insurance document, for we were unable to get a Comesa Yellow Card (equivalent to the European Green Card) in South Africa. We already had 3rd party cover for most of Africa already through our comprehensive policy with Cross Country Insurance, but whether the police at the road blocks would accept it was another matter. We decided to politely argue the point, although the customs chaps were only demanding US$16, as a matter of principle - nothing ventured, nothing gained. In the event, we settled on US$15 for our insurance as they accepted that we already had cover, but we needed police peace of mind further on! We had read and heard that Zambian road blocks were problematic, but in point of fact, were were only stopped once and the police could not have been more polite throughout our time in Zambia. Let us hope we experience this further on, but somehow we doubt it! 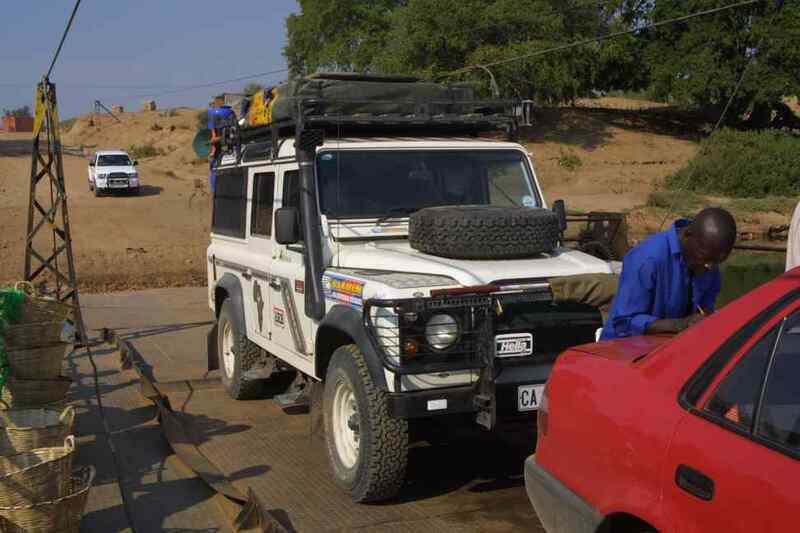 The road to Livingstone was appalling, very badly potholed - the worst form of road surface! 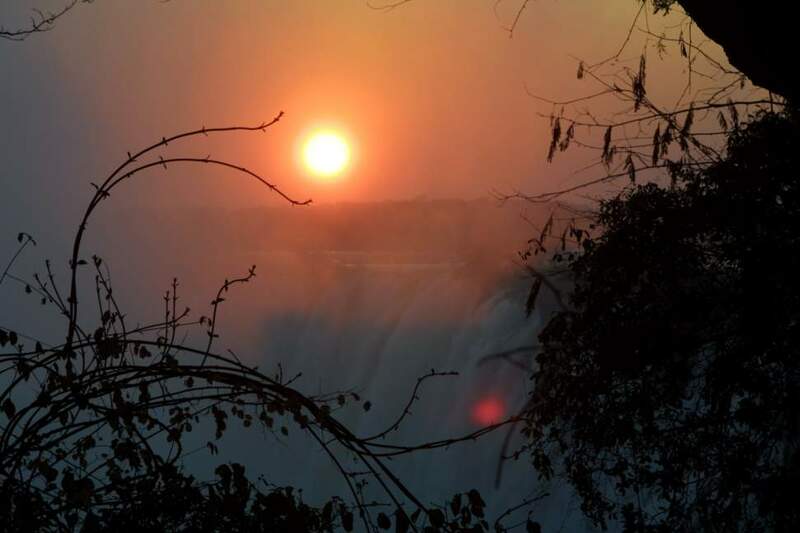 Livingstone,originally the capital of Northern Rhodesia, had the air of a town well past its former glory, was eclipsed when the capital was moved to Lusaka, more of a central location in the country. There were people everywhere, a throng of locals clamering for our attention; to wash our car, watch and or guard our car, show us were we need to go or change money. We were polite but firm, and they left us alone. Livingstone town is some 12 km north of the falls and our campsite was only 6km or so away. 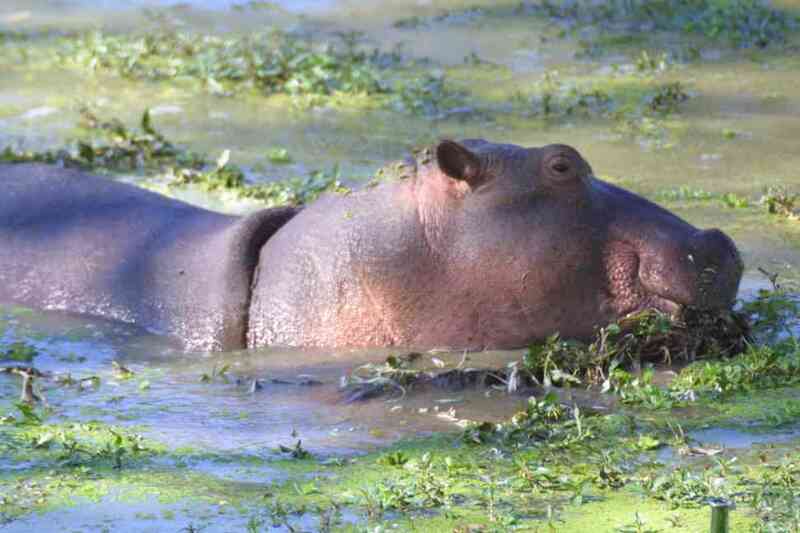 Maramba River Lodge was a quiet, grassy site, with clean facilities and plenty of hot water. We stayed a couple of nights, pitching the Oz tent to mark our pitch whilst we visited the Falls and checked emails etc, and were able to do all our washing. The Falls are stunning. 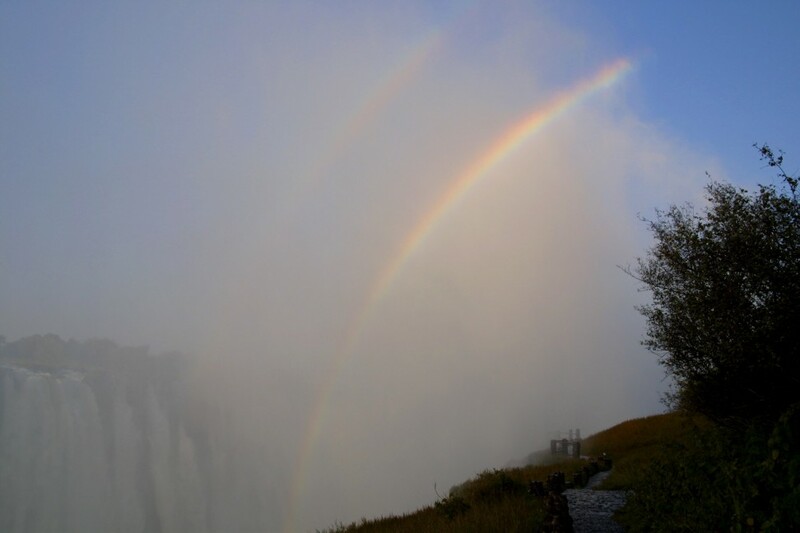 Although we had seen them from the Zimbabwean side in 1997, we thought the view from the Zambian side was more inspiring. One gets closer to the drop and feel the awesome power of the water. Howerer, if there is high water, as experienced this time, the spray can obscure a full view and make photography challenging. We crossed a small footbridge (Knife-Edge Bridge) to a small outcrop for a very wet view. Thankfully we borrowed some rain-macks that the Zambians were selling - never an entreprenuerial opportunity missed! 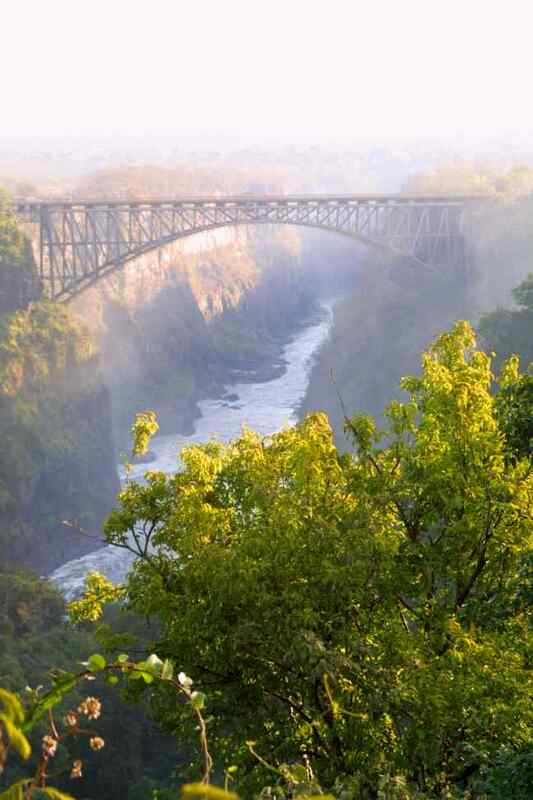 From one of the viewpoints we could see into the Zimbabwean side and witnesses people launching themselves off the Rail Bridge with only a large elastic band for safety. We met many travellers who had been accross to the Zimbabwean side. They told tales of very good exchange rates and business as usual, despite the recent occurences within the country. Apparently petrol/diesel is plentiful and cheap. 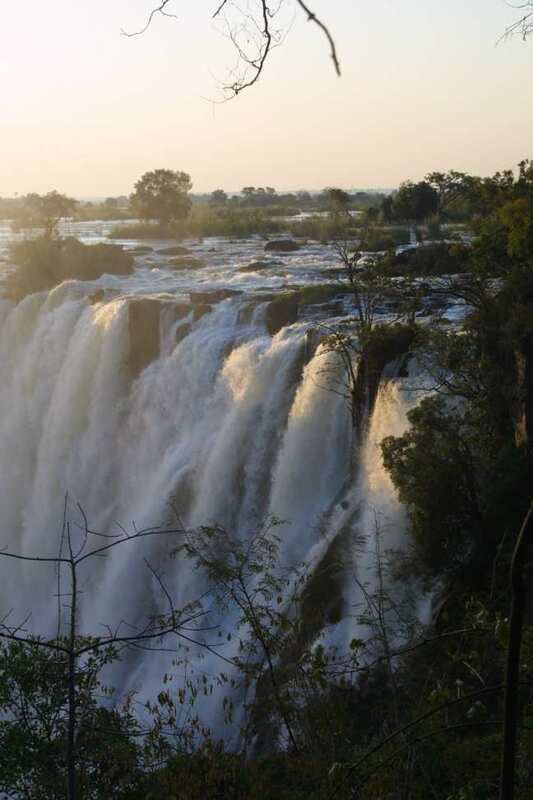 The tourist industry in Zim has taken a massive hit though due to the political situation, and the Zambians have not been slow to cash in on this. Staying in the Victoria Falls Hotel in 1997, we enjoyed their fine 'High Tea' on the verandah, overlooking the rail bridge and participated in a 'dinner dance', where Adrian had to borrow a tie from the management (who maintained a store in the lobby for such eventualities!). On this occasion, we visited the Royal Livingstone Hotel for their 'High Tea'. The recently built Hotel appears to be a minature replica of the Victoria Falls Hotel, aimed at attracting the upper end of the tourist market. Though we found it interesting, it did not have the atmosphere or history of the Victoria Falls Hotel. Run by Sun Internatioanl Hotels, there was the Casino option for modern entertainment rather than 'dinner dances'! An excellent small museum is maintained at the entrance to the Zambian Falls side, which explained the geological faulting and scale of the falls very well. There was a wealth of information on the indigenous people and their history. The custodian took us round, and was almost word perfect in his story boards! 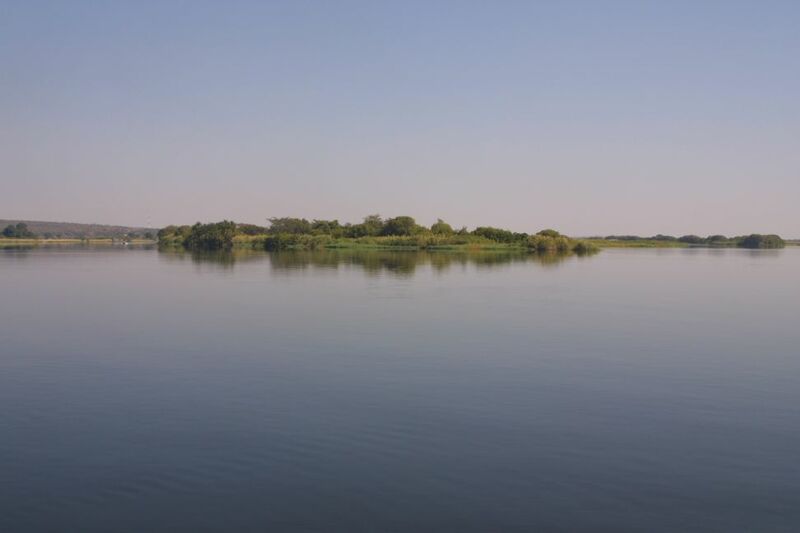 We decided to visit Lower Zambezi National Park before we travelled to South Luangwa. The road from Livingstone to Lusaka was tarred, but badly potholed (in our opinion the worst surface). Long stretches were in the process of being refurbished, which meant that we were often diverted onto gravelled road, which actually was preferable to potholed tar. The road to Churindu wound down through the mountains to the border with Zimbabwe, and was again heavily potholed. In addition there were many extremely heavy trucks, together with others which had broken down and were blocking the road. 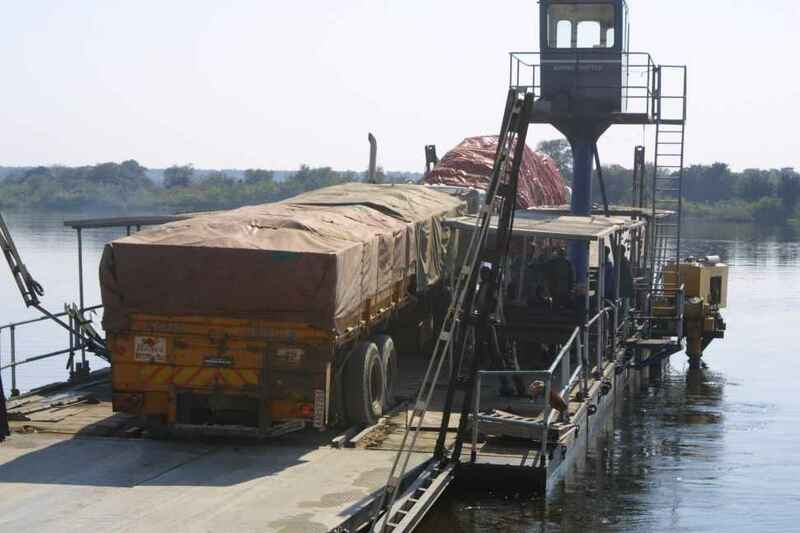 Chrindu itself was just a mass of goods lorries waiting to be processed across the border - there appeared to be no shortage of trade through Zimbabwe! The entrance to Lower Zambezi Park is some 75km along a graded track (poorly marked! 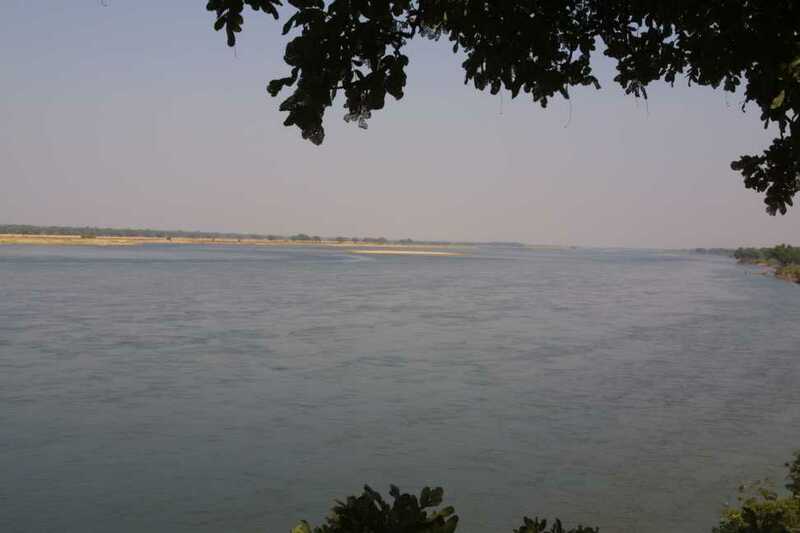 ), that follows the banks of the river itself. 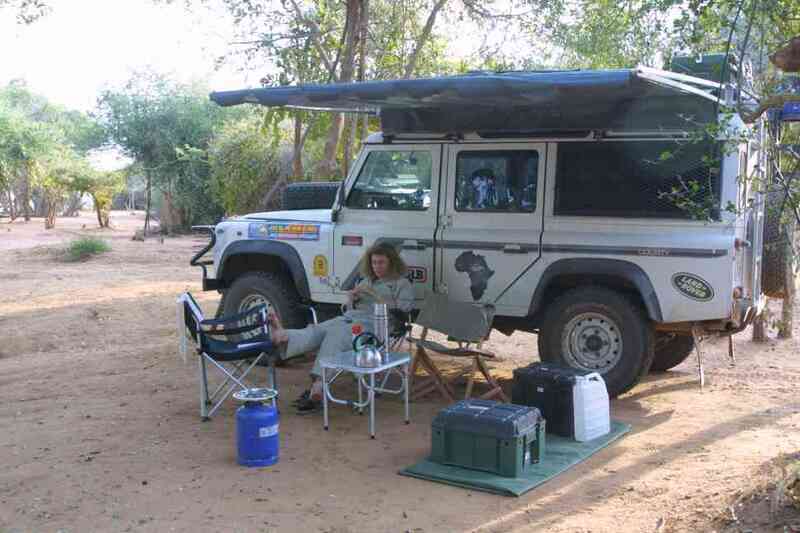 Due to the poor roads, there was no way we would make the park the first night - thankfully the campsite at Gwabi Lodge provides an excellent stop-over on the banks of the Kafwe River, en-route to the park. 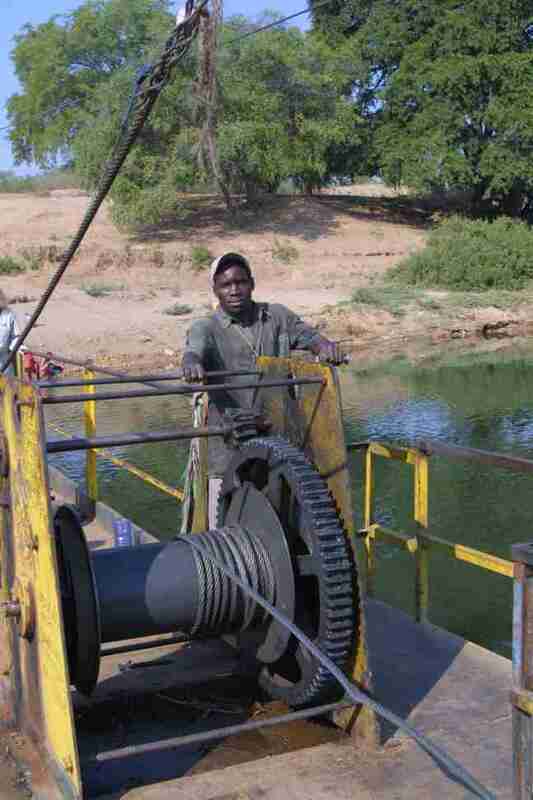 The next morning we had to negotiate the Kafwe ferry, a hand cranked contraption moving along a twisted and frayed steel hawser. There were villages on the banks of the river and along our route to the park, and a continuous stream of people were using the river for washing clothes, dishes, and themselves. 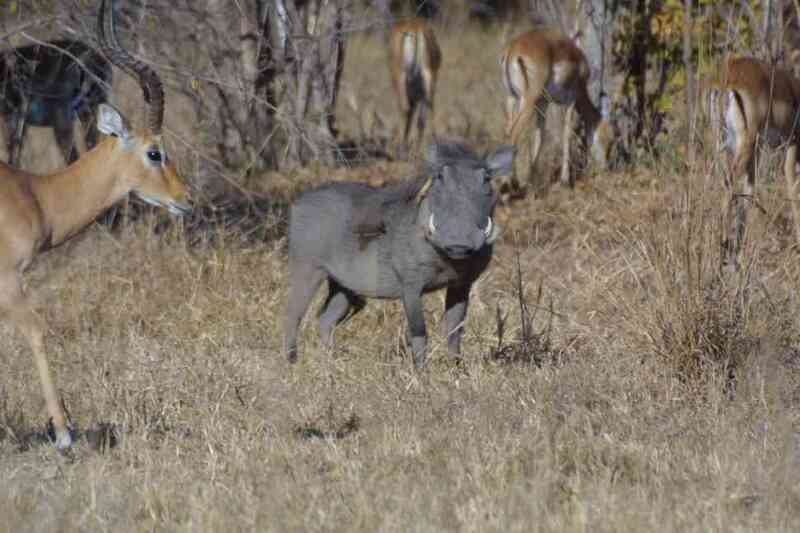 The wilderness of Lower Zambezi National Park lies opposite the well known Mana Pools area of Zimbabwe. 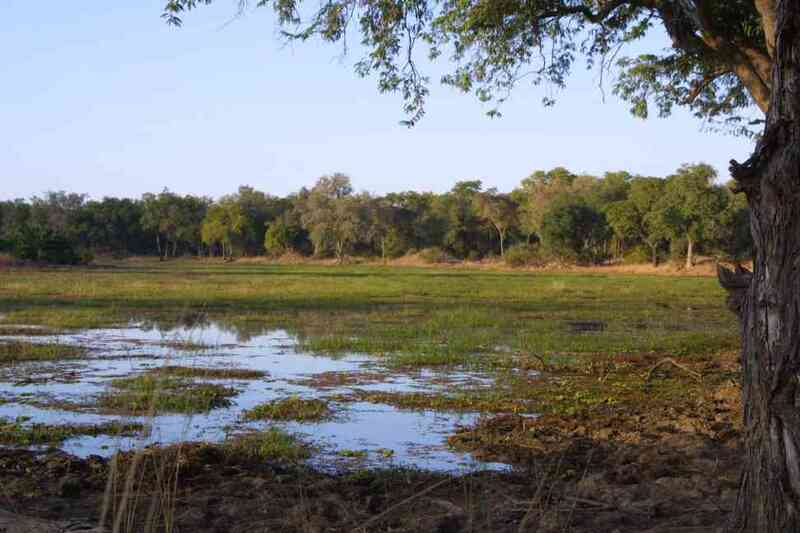 There is a wide diversity of vegetation in the park, from riverine and flood plain to the mopane forests and broad leafed woodland. In the past there has been heavy poaching, but numbers of elephant and buffalo are rising again, and the park is home to the big five (lion, elephant, buffalo, leopard and rhino). 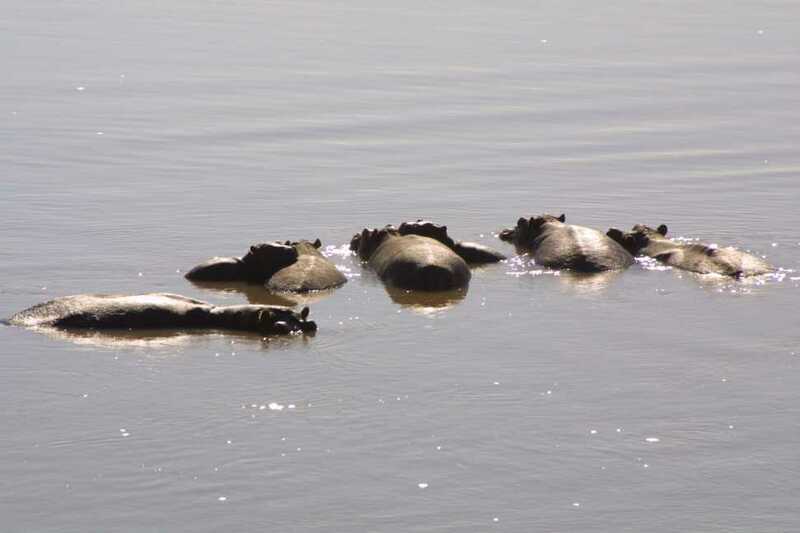 The Zambezi supports large numbers of hippo and crocodiles. 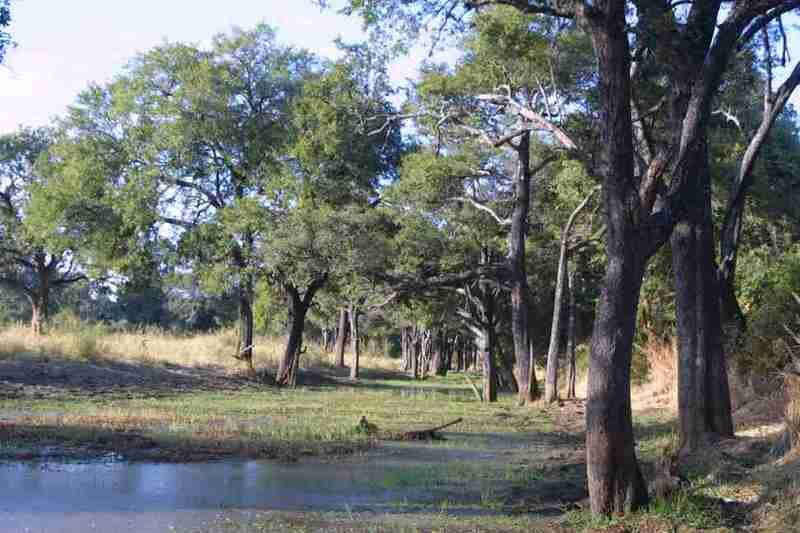 The park lies to the east of the Chongwe River, and there is no provision for camping as yet. 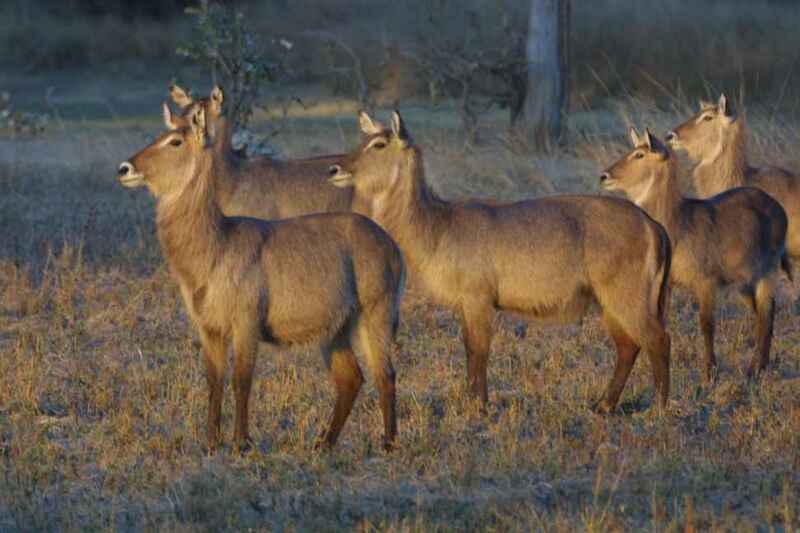 However, there are a number of campsites and luxury lodges in the adjacent game management area. As we arrived during a national holiday weekend, it appeared most of the campsites were full. The community campsite was empty, giving us the opportunity to effectively camp wild within the game management area. Most tourists fly in to this area or travel by boat, as the roads are challenging. We visited via floatplane some years ago on our honeymoon, staying at Kayila Lodge, in the treehouse room a few metres from the river bank. As we were passing, we decided to call in. We met Dave and Elspeth, who had been running the camp for 9 months. 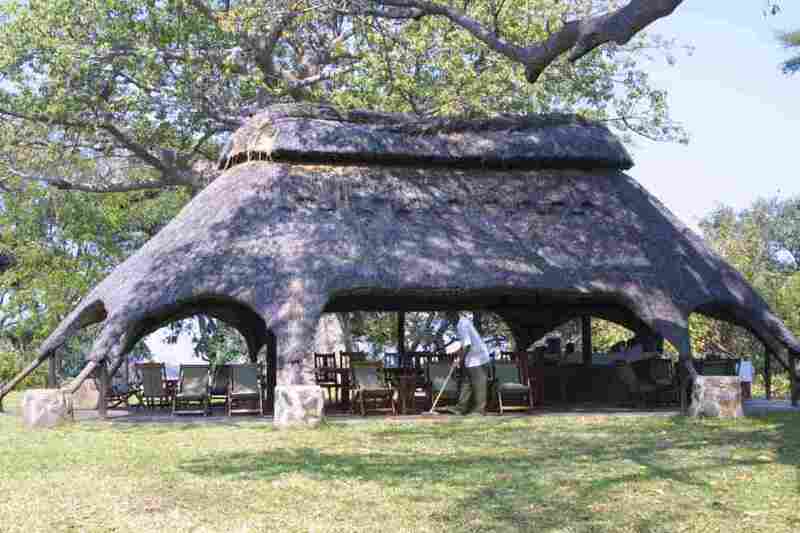 The lodge was as we remembered it, the welcoming lapa beside a large baobab tree within which was the same flushing toilet. The view from the tree house had been improved by removing some of the overhanging branches. The owner at Gwabi lodge had suggested that it might be possible to drive through the park exiting on the eastern border. 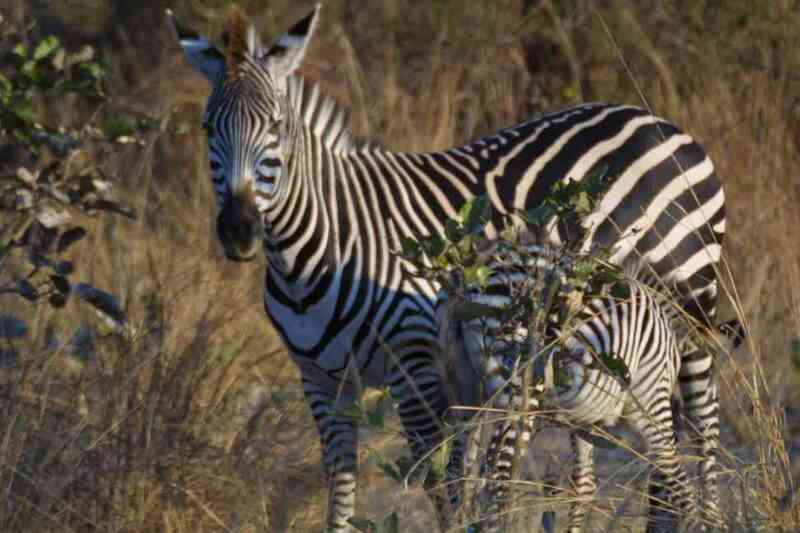 This was particularly appealing to us, as we planned to travel onward to South Luangwa Park. We had not read about this option before, and discussed it with Dave and Elspeth, who were uncertain about the state of the road, as they did not think it had been used recently. They put us in contact with a couple of local experts, Roddy and chris, who were both extremely helpful but very doubtful about the route. The road has not been used for a number of years, so the track was overgrown - in fact Roddy tried to find it unsuccesfully some months back. This meant that we would have to retrace our steps in order to go to South Luangwa, but since this was our original expectation, we were not surprised. We woke early the next morning, expecting to enjoy an early game drive in the park, but our plans were thwarted by a lone bull elephant eating his way along the river vegetation, some 5 metres away from Daph. Although he was not threatening or bothered by our presence, we were careful not to disturb him, and enjoyed our own private elephant viewing. This delayed our departure by nearly 2 hours, thus limiting our opportunity for game viewing. The village of Lusaka developed following the construction of the Cape to Cairo railway in 1906 and became the centre for colonial administration in 1930, eventually subsuming Livingstone as the capital in 1935. Approaching Lusaka from the south, a modern, monolithic skyline is in evidence. This was as a result of the financial boom created around the time of independence (1964) prior to the country's economic collapse. Although we arrived on Monday 1 July (Independence Day holiday period) the shabby deserted city centre appeared quite run down. We drove throught the centre and exited on the East Cairo Road to reach Pioneer Campsite, near the university. We passed Mander Hill, a new American style shopping mall where we hoped to buy provisions. Western aid is gradually improving the city, notably the Japanese were funding a road and cycleway project along the Cairo Road area and university. 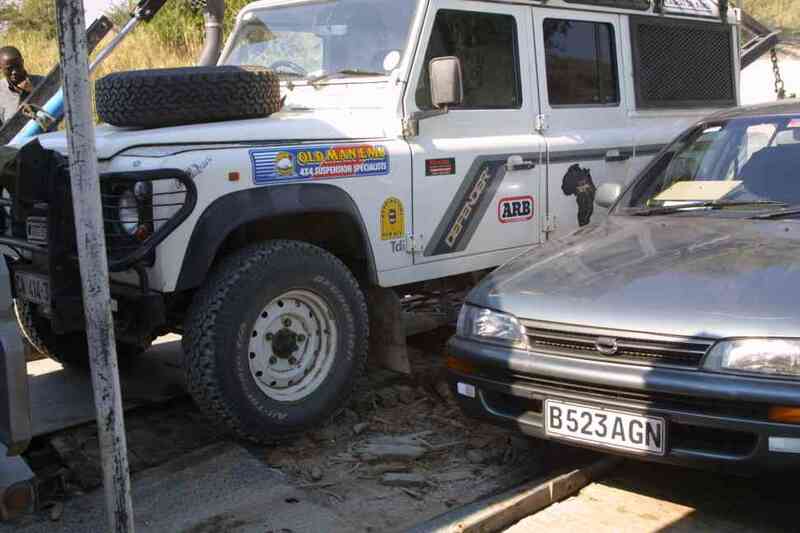 What struck us was the large number of brand new aid vehicles, most of which appeared to be Toyota Landcruisers, driving straight through the potholes. Our guidebook suggested that it would take 8 hours to travel from Lusaka to South Luangwa National Park, via Chapata along the East Cairo Road, which had supposedly been improved and was billed as the best road in Zambia. After a delayed start, we found the road was good tar until after the Nyimba Bridge, but subsequently deteriorated, becoming badly potholed. consequently we reached Chapata half an hour after night fall. It was always our intent to avoid driving at night, and our apprehensions were confirmed. whilst we were not concenred about our security, it was virtually impossible to see or read any signs in the dark and it took us over an hour to find our recommended campsite, The Yellow Chicken! On arrival though, it turned out to be a delightful campsite. The owners were extremely helpful, and gave us directions to the local farm shop (excellent fresh meat), and details of where to obtain a Comesa Yellow Card, which we hoped would save us having to buy 3rd party insurance at each border. We were able to buy our Yellow Card for $90. The card would cover us for 3 months, though the vendor told us that Tanzania was not participating in the Comesa scheme any longer. (NB This was in fact untrue, as we found later when we reached the border). South Luangwa Park is the most famous game reserve in the country due to its abundant wildlife and a long history of wildlife protection. The first game reserve was established in 1904 to protect the Thornicroft Giraffe (a subspecies specific to this area). A feature throughout Africa is the conflict between farmers and conservation, and in the Luangwa Valley the vast elephant herds were subsequently hunted in the 1930s. It was not until Norman Carr proposed a scheme in 1950 to create a conservation area from which the locals derived benefit that the modern park was created. 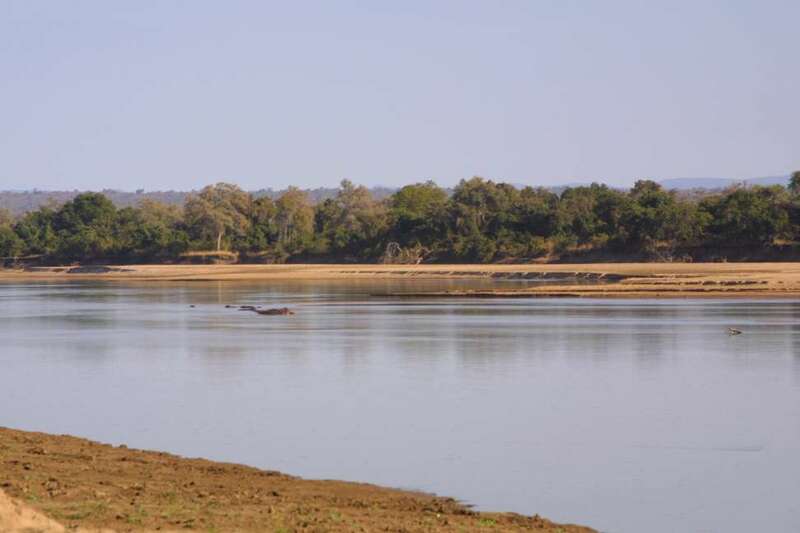 The Luangwa Valley is the lower part of the famous African Rift Valley, and it is this escarpment that protects the wildlife and allows subspecies to develop. 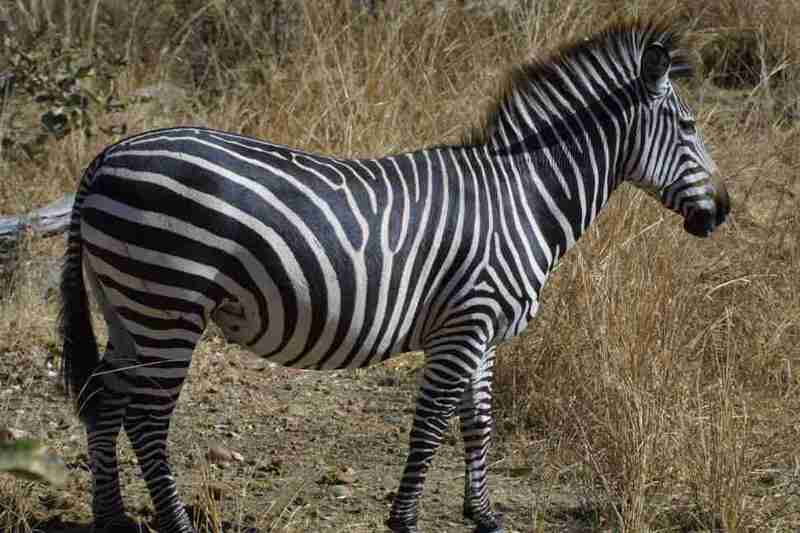 Two other subspecies present here are the Cookson's Wildebeast and a subspecies of Burchill's zebra. 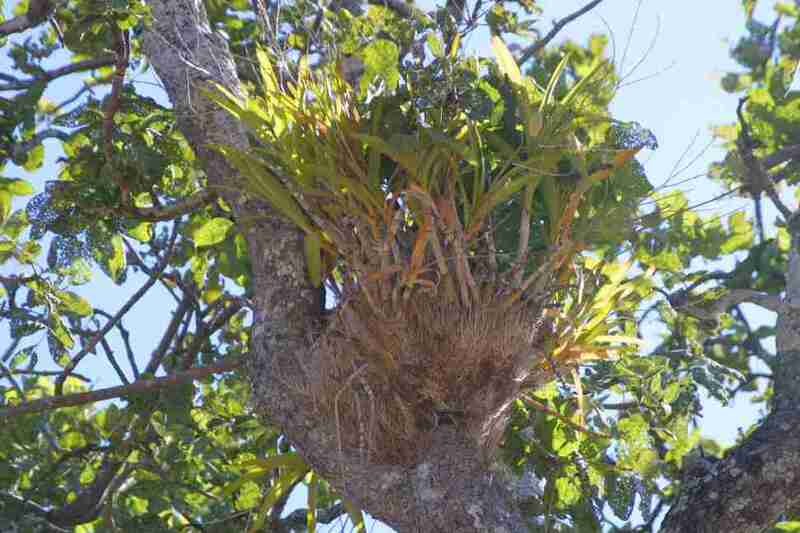 Vegetation in the park is very varied, and the bird life is extensive. Sadly, poaching reached endemic proportions in the 1970s, and only a fraction of the original 100,000 strong elephant population survived. Of the big five in the park, there is considerable doubt whether any rhino remain, and if so, their location is a closely guarded secret. 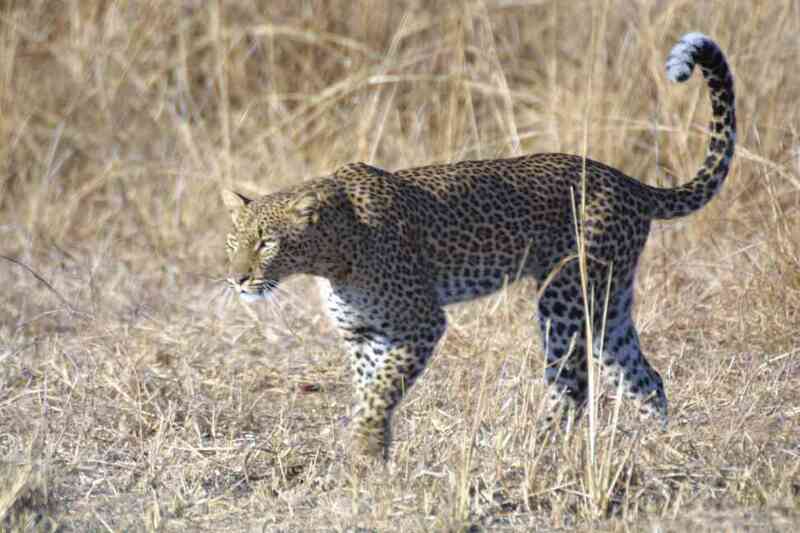 Predator sightings are common, particularly leopard, and most camps and lodges lie along the Luangwa river, which is home to a wealth of hippo and crcodile. 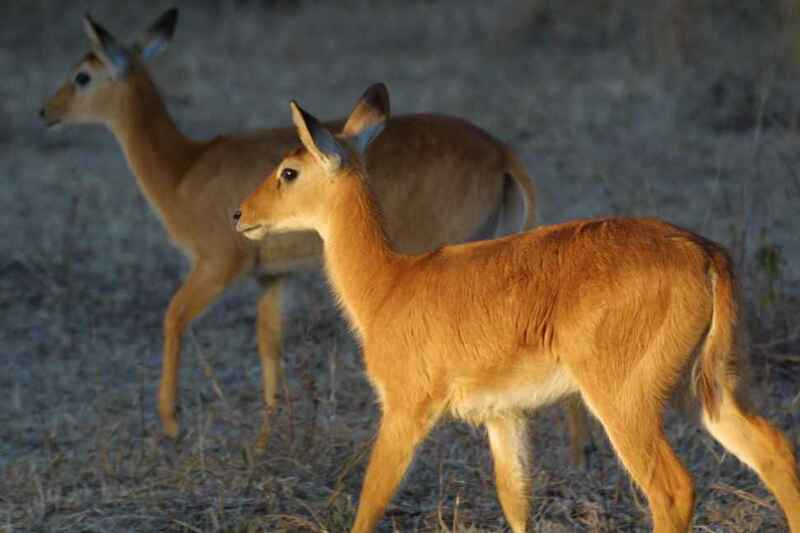 Whilst walking safaris are conducted elsewhere in Africa, South Luangwa is particularly known for these, with knowledgeable guides and game scouts. The road from Chipata to Mafuwe was graded and took us around 2 hours (roughly half the time suggested by our guidebook due to recent re-grading). Whilst driving along a relatively benign stretch our driver's side window shattered for no apparent reason, and collapsed into the door housing. We were thankful for the clear safety film which had been fitted, for it kept the shattered window together. 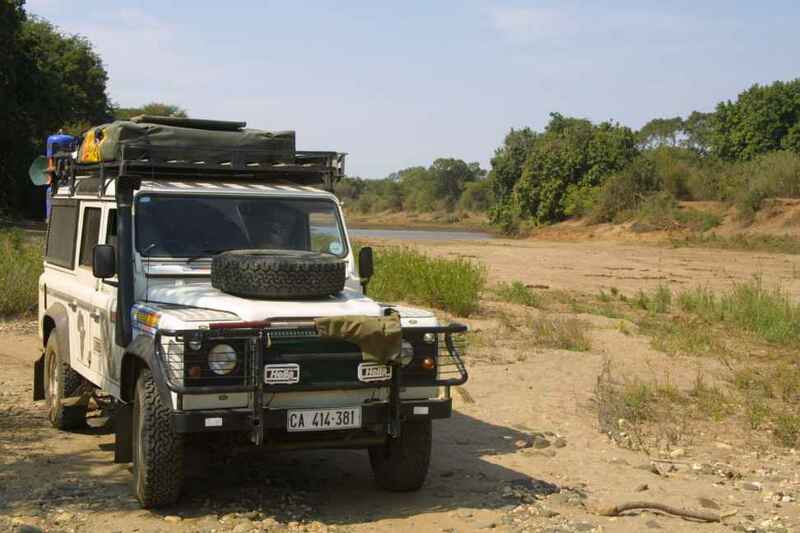 We decided to carry on rather than return to Chipata, on the theory that there would be at least one Land Rover game vehicle without a door, and so potentially a spare window. We were heading for Wildlife Camp, a recommendation from the owners of the Yellow Chicken campsite. On arrival we told the owners, Herman and Peggy, our problem with the window. Whilst they did not think anything could be done immediately, about half an hour later Herman appeared from his workshop with an old window which he thought might fit. An hour later, the window was in place - a perfect fit! We took a dawn game walk with our local guide, Peter, and a game scout, Cassius with his rifle. We were very lucky to see 2 leopard up a tree, elephant and hippo at close range. Peter's knowledge of the local flora and fauna was excellent, and he was able to give us many interesting pieces of information - much of it quite technical and scientific. 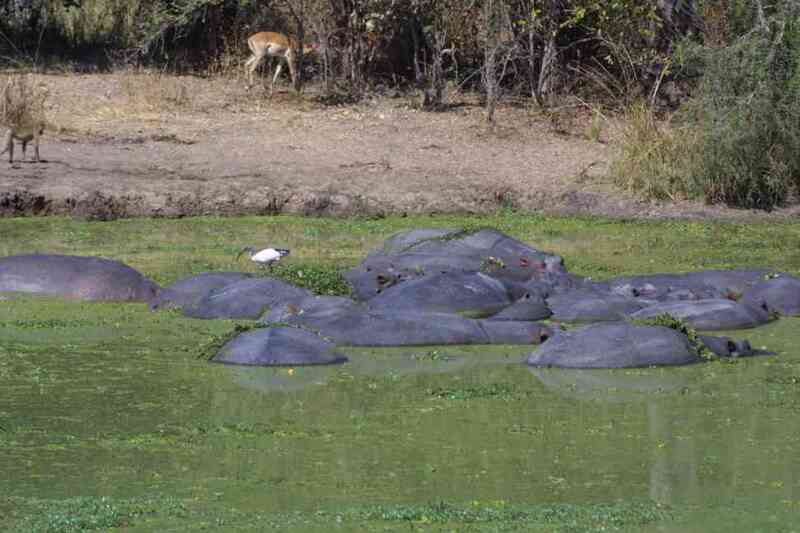 Two hours into the walk, we stopped on the banks of the river overlooking a pod of hippos for tea and a muffin. As we returned to the camp, we had to divert our course several times due to grazing elephants. That evening, we went on a night drive. 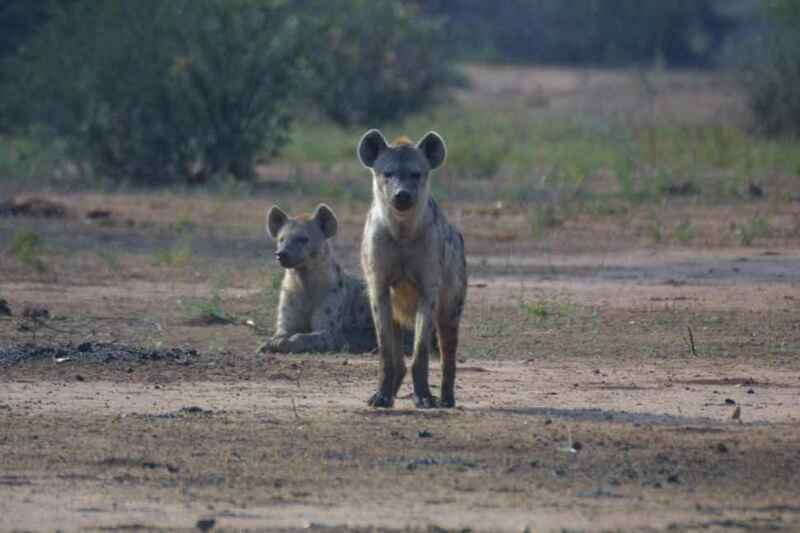 In contrast, we saw very little, but our guide was again extremely knowledgeable. We saw no predators, just African wildcat and civet, hippo and elephant, and a variety of ungulates, including a Thornicroft giraffe. The park is well signposted, and it is easy to drive around independently. We drove round the following morning, as the park fees (which we had to pay the previous evening) are for a 24 hour period. We saw a leopard, and a wide variety of game. The drive was very relaxing - the roads were good and the vegetation more interesting than most other parks we had visited. Poaching is not such a problem today as it once was, although with the threat of famine, shooting for the pot and hunger are strong motivators. 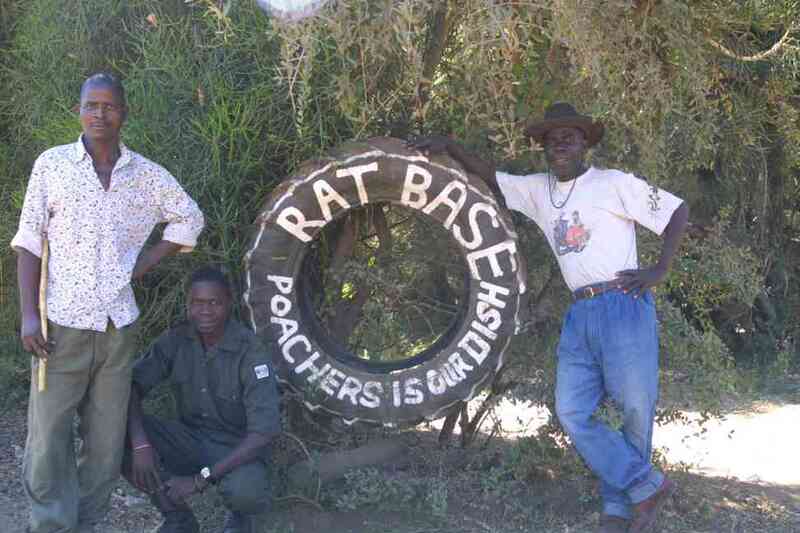 The Park has an anti-poaching Rapid Action Team (the RAT) available to counter any threat! We relied on our 'Illustrated Road Atlas of Africa' and sketch maps in the Lonely Planet guide. These were sufficient for the main roads, though we did have to check on directions at our campsites regarding routes to the Lower Zambezi Park (and question other potential routes through the Lower Zambezi Park that did not materialise!). We both enjoyed our time in Zambia and would have stayed longer had time allowed. We heard dire predictions about Zambia prior to arrival, not least the threat generated by famine and the corruption of local officials. In fact we found the opposite. Other than the dreadful state of the roads (that everyone moans about but does little to resolve), the police were friendly and helpful - although we were mostly waved on at road blocks; the people were generous and interesting, yet the threat of famine is a concern, especially for those in rural areas (interestingly where the aid is targetted but rarely reaches!). Maize is is the accepted measure for famine, but other foodstuffs appear to be available. We noted crops, irrigated fields and plenty of food being sold along the roadside. Allegations of famine are generated at Government level, for having sold their all their maize reserves to Tanzania at a good price (following a suggestion from the IMF to 'rotate' some of their reserves! ), it appears they have failed to replace a reserve. Now it is hand-out to the West for assistance! Clearly a mismanagement issue - it would be interesting to know what has happened to the revenue of the initial maize sale? Even if maize was available, it remains that the poor in the rural communities that cannot buy food as they have nothing to sell due to crop failure, thus no income. These general impressions arose from our brief visit and do not represent any official view. We only saw a small portion of the country, much of which remain tourist/traveller destinations.